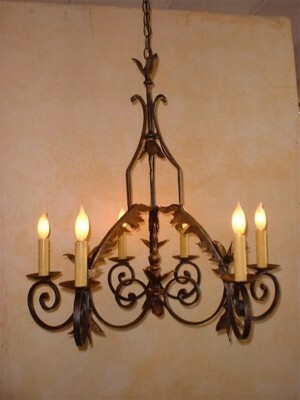 Our hand forged chandeliers are truly a sight to behold. These chandeliers are the product of many hours of skilled labor, and are truly a focal element in any home. Approximately 30" wide and 30" tall. This is our trademark chandelier. It is completely hand forged from solid iron and represents over 40 hours of skilled labor to produce. Fabulous closeup detail, a focal element. Fired by discretely placed LED's above the leaves. Also available with electric candles. approx. 32" span. A larger version for rooms over 12' x 12' in size. Approximately 45" wide, available in various configurations, custom built for your ceiling height and room size. Also available with electric candles. 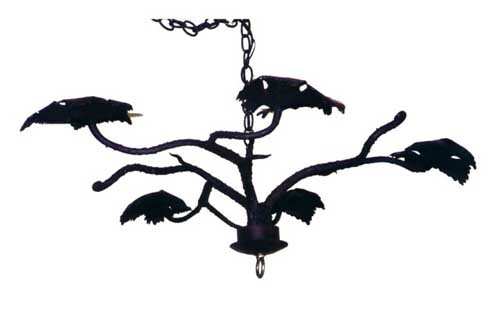 Iron Cage Chandelier 14" x 36"
Classic old world style hanging iron cage chandelier. 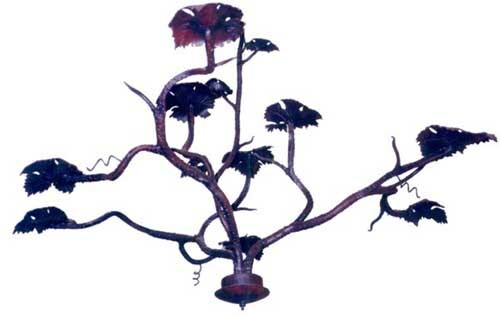 Iron Cage Chandelier 20" x 48"